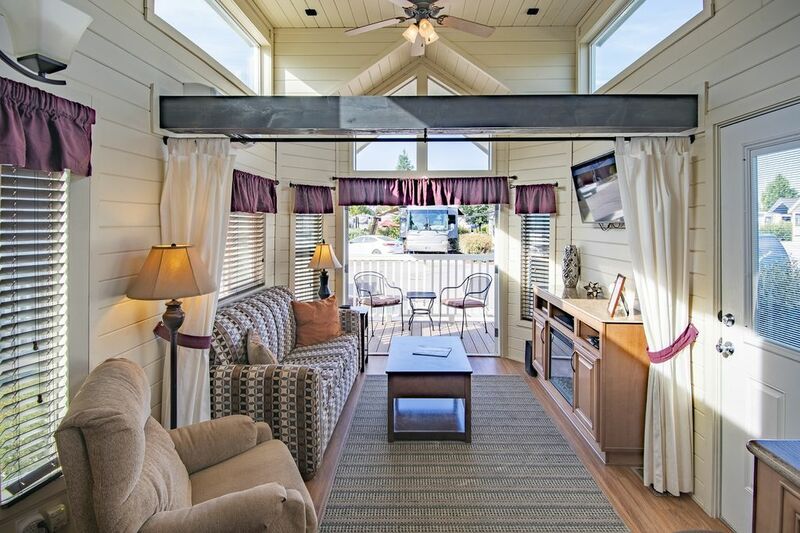 Beauty, adventure and luxury are waiting for you at Vines RV Resort. Nestled in the fabulous wine country of Paso Robles, CA, located at 88 Wellsona Road, the Vines RV Resort offers fantastic luxury accommodations and amenities including swimming pool complex, fitness center, lounge and more that are sure to impress. There are also a great selection of local attractions like local wineries, San Luis Obispo (SLO), Pismo Beach, Hearst Castle and much, much more! Come and experience life to the fullest at Vines RV Resort. Our breathtaking one bedroom cottages feature a bedroom with a queen bed, overhead loft area with a full size mattress (4ft high ceiling height) and a full size sleeper sofa in the living area to comfortably accommodate up to 6 guests. Tastefully decorated and completely furnished, these rentals feature a fully appointed kitchen with a refrigerator, stove, oven, microwave, toaster, coffee maker, cookware and dinnerware. The private bathroom includes a stand up shower. Other features include a flat screen television with cable, resort-wide Wi-Fi and linens. Outside amenities include a covered patio, table with chairs and a gas grill. Please ask about our pet friendly cottages.